Since Nottingham Victim Care started in January 2017, restorative justice has been an important part of our service and we have seen the benefits of the restorative process through a range of offences, including homicides and serious life changing assaults. Our work with restorative justice has also drawn attention from partners and stakeholders across the county, and there is real interest in its application within communities as a tool for fighting hate crime and opening up dialogue across different groups to increase understanding. It’s our ambition to use our Community Points to establish a ‘Restorative Network’ across Nottinghamshire, which will open up the offer even more so. We have had 44 successful restorative interventions and our surveys show 100% satisfaction for those participating in restorative justice. The transformative impact has been clear from the feedback from both parties following every intervention, with one of our victims stating it had been a ‘life changing’ process, and that they saw things ‘completely differently’ since attending the conference. To hear this makes us incredibly proud of the work we do, and demonstrates that the process is entirely worthwhile – which is only validated all the more for being acknowledged by the Restorative Justice Council in this way. Achieving the quality mark gives us greater confidence that we’re not only getting it right, but facilitating restorative justice to a nationally recognised, high standard, having been scrutinised by industry experts. 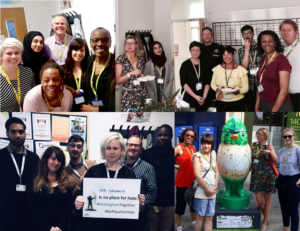 Working through the application process also gave us a good opportunity to reflect on what we want our restorative justice offer to look like – how do we already make it central to our support and how could we ensure we’re always offering the best service to all those we work with. Putting restorative justice at the heart of our service. At Victim CARE it’s been a conscious effort to integrate restorative approaches into how we run the whole service, and to not just see it simply as an intervention within our offer for victims. To this end, all of our Senior Caseworkers are trained Restorative Justice Facilitators too, so they have a greater understanding of the concepts, even though they may not be necessarily facilitating interventions. Restorative justice is also at the forefront of the conversations we have with all service users, and discussing it is very much a part of our team culture, embedded in all of our team meetings, supervisions and our appraisal processes. This seems to be the most important contributor to our achievement of the RSQM – it is easy to unwittingly side-line restorative justice when running a holistic victim service; to see it as only a small part of a victim’s journey to recovery. But I think that any service going for the Quality Mark should ensure that the values underpinning restorative justice are at the centre of everything they do, which not only benefits participants, but all service users you work with.